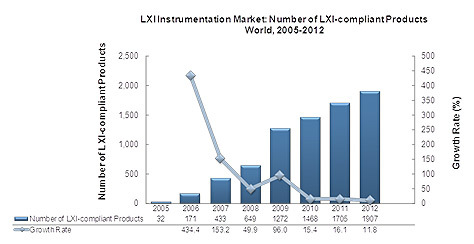 As the next-generation control interface for box instrumentation, the LAN eXtension for Instrumentation (LXI) standard has witnessed significant adoption among instrument vendors since its introduction in 2005. Research performed by Frost & Sullivan estimates that the market reached $644.0 million in 2012, representing a significant percentage of the total market revenues in the automated test market. Over the next few years, several factors are expected to fuel demand for LXI instrumentation; among them, the benefits from Ethernet and specific aspects of the LXI standard such as the conformance testing required. The Large Hadron Collider (LHC) at the European Organisation for Nuclear Research, known as CERN, has come to the forefront of public attention recently with the discovery of the Higgs boson – the so called God’s particle. CERN operates a high energy collider 100m under the Swiss and French border near Geneva to explore the boundaries of high energy physics. It is high energy physics on a huge scale, matched by no other facility in the world. The collider operates a pair of counter- rotating particle rings which have crossovers at four experiment sites where particles crash from opposite directions into each other and create the signatures that indicate the presence of short lived particles, and that has recently included the Higgs. Building an LXI-based Test System involves planning and includes meeting the Test System requirements and company LAN access requirements. Without understanding both sets of requirements prior to assembling the LXI Devices into a particular LAN Configuration, you run the risk of non-optimal Test System communication, wasted time troubleshooting, and potentially violating company policies with regard to LAN Security. The LXI Consortium has created three documents to help reduce or eliminate these risks, which are located at GuidesForUsingLxi. The LXI Getting Started Guide helps the first-time user understand the behavior of LXI Devices when connecting to LAN. Building LXI-based Test Systems and Introducing LXI to your Network Administrator contain illustrations and guidelines for combining multiple LXI Devices and connecting them to the company LAN. They are written for the Test System Developer and the Network Administrator, respectively, with the goal of cooperation to achieve desired outcomes. This article discusses a real-life project team that built an LXI-based Test System. They did not have the benefit of these documents as a basis to plan their Test System LAN Configuration and had to discover and overcome these LAN challenges on their own. The WaveXciter Series can generate literally any waveform, at frequencies up to 1GHz with 8 digits of resolution and 1 point granularity. The R&S FSW50 signal and spectrum analyzer characterizes wideband signals continuously up to 50 GHz. The Kepco Series KLN is a new family of automatic crossover, low-profile, high-performance, low-cost programmable power supplies. Industry’s fastest 1,000,000 waveforms/sec update rate; MegaZoom IV uncompromised smart memory technology; standard segmented memory. This conference will focus on technical challenges and solutions for connecting instrumentation via the network and demonstrate how these are addressed using LXI. The conference will feature a trade show for LXI Consortium members to demonstrate their latest LXI products and feature sets. To register for the conference, go to http://www.lxistandard.asia.